As a wedding photographer I am often asked by my clients what is going to happen if they experience bad weather on their wedding day. I always reassure my couples that I have more than thirty years experience as a wedding photographer and I have seen every possible type of inclement weather than they can ever imagine. I will use all of my resources to create the most amazing wedding photographs for you, regardless of what Mother Nature throws your way. All great photographs start with great lighting and we bring more equipment than we need, to every event, to insure that we can create the perfect lighting in every environment. When interviewing potential photographers for your wedding make sure they have a diverse portfolio showing images captured under every conceivable condition. Nearly anyone can take a nice picture on an overcast afternoon. Make sure your photographer has experience creating detailed images in dark reception venues, in less than perfect interior locations, and during less than ideal weather events. Bad weather can often lead to some of the most incredible wedding pictures, too. This image was created on a day when intense storms were approaching. I was so happy for this couple that the weather held off until after their outdoor ceremony and cocktail hour. They had retired with their wedding guests into the ballroom for their reception. I kept my eye on the approaching storm (and even tracked it on a radar app on my smart phone). Just before the deluge I brought the bride and groom out to this spot at their reception venue. 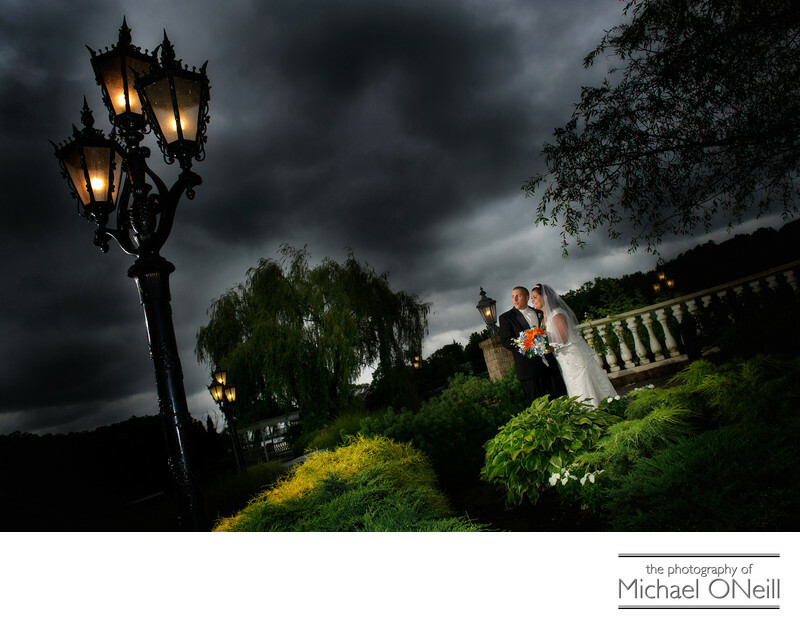 Using an off camera light held by my skilled photo assistant I illuminated the couple against a backdrop of the approaching storm clouds. By manipulating the exposure in my camera I was able to make the environment look more threatening than it really was. It took less than a minute to create this powerful image and the bride and groom were quickly back in the dry safety of their ballroom before the heavens opened up.